With all that size on the outside, the cabin too is large and generous, resulting in ample amount of space for both front and rear occupants. But first, the dashboard, it’s a new refreshing unit and looks quite appealing with the use of wood, silver and of course beige. This cabin does use a lot of beige for that airy feeling and it works. The dual tone dash is nice to look at with the only sore point being the the parts which come from cheaper Maruti cars, like the steering wheel and power window controls. Talking about the steering, the placement of Bluetooth controls could be on the right spoke rather than between the first and second spoke for ease of use. Quality inside the cabin is good with not much to fault but build quality isn’t as good as its rivals, we could hear some rattling from the dashboard on our test car which had done slightly more than 5000 kms. The seats are comfortable but finding the perfect driving position isn’t as easy as the driver’s seat is quite high, even when you adjust it to the lowest position. Even the rear seats lack on the comfort front, they just don’t have enough cushioning to keep you happy over long journeys. However, when it comes to rear legroom, the Ciaz is simply fantastic and there is so much space that even the tallest of people won’t have any room for complain. Headroom though, is in short supply, specially for tall people. The boot is big although it’s not the best shaped due to the protruding wheel wells. The electromagnetic tail gate opener isn’t the easiest to operate and sometimes you do have to push it twice. 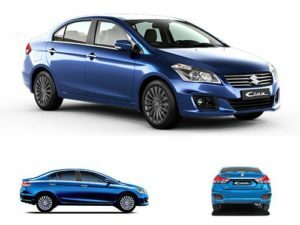 The Maruti Ciaz has a generous equipment list and the car comes with ABS, dual airbags, climate control system, Bluetooth connectivity, keyless go, push button start, easy to read multi-information display, projector headlights, rear camera, reverse parking sensors, leathers seats and touch-screen infotainment system (gets navigation and MirrorLink) which is offered on the Z+ trim while our test car was a ZXi (O), making do with a non-touch based audio system that has CD, USB, AUX and Bluetooth audio options. This system doesn’t display the song name on the screen which is surprising as that’s a basic feature seen on most head units. Some nice touches include a rear windscreen sunblind and plenty of storage bins including large door pockets. The car gets side lights at the rear, thereby having a cabin light for each occupant but there is no vanity mirror on the sun visor. One thing we did not like about the keyless go is the cheap rubber button the door handle that just feels like it will come off. That said, the Ciaz makes for a fine car to be chauffeur driven in, the AC works well and the rear aircon vents do a good job too.